Jordan Peele’s follow-up to Get Out is a horror/thriller masterpiece. Lupita Nyong'o sorts out her personal demons in Us. Written and directed by Jordan Peele. With Lupita Nyong’o and Madison Curry. Now playing. 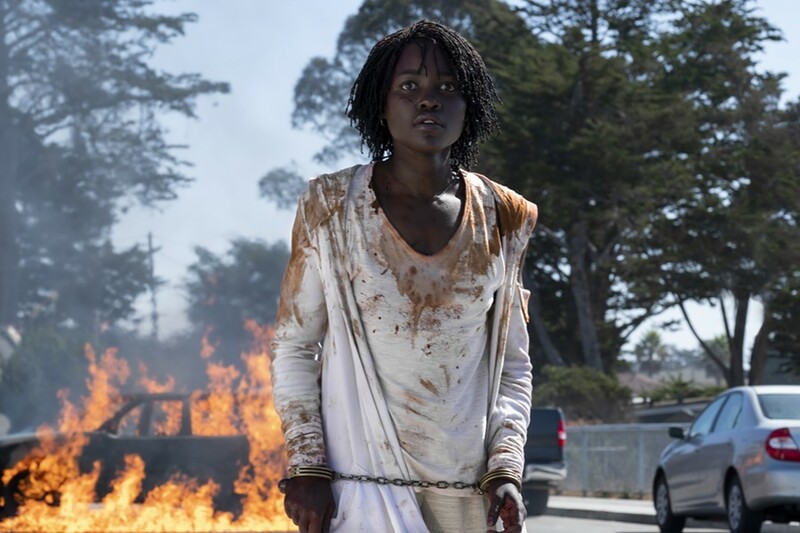 Jordan Peele’s Us is the best film, so far, of the young year 2019. The simultaneously silky-smooth yet violently turbulent horror thriller is also proof that actor-turned-writer-director Peele has successfully avoided the sophomore slump. His filmmaking 2017 debut Get Out was one of that year’s finest movies, and Us is every bit as accomplished a piece of well conceived popular entertainment -- with meaningful writing, alarmingly creepy performances by a large cast, and production values that will cause an epidemic of sleepless nights. The story opens more than 30 years ago at the Santa Cruz Beach Boardwalk, when a young girl named Adelaide (Madison Curry) has a nightmare experience at a ghostly house of mirrors attraction, sitting all by itself, empty, at nighttime on the beach. That shock stays with her, in her dreams, and so when we rejoin the fully grown Adelaide Wilson (Lupita Nyong’o) and her family as they arrive at a friend’s lakeside summer home to spend their vacation, she is visibly nervous about returning to the Santa Cruz area. Her ebullient husband Gabe (Winston Duke), their teenage daughter Zora (Shahadi Wright Joseph), and younger son Jason (Evan Alex) are plenty stoked about visiting the Beach Boardwalk, but Adelaide cannot put away her premonitions and hallucinations so easily. In the middle of the night the Wilsons are awakened by the presence of four indistinct figures gathered together, standing motionless at the foot of the driveway. Duplicates of themselves, as it turns out. Doppelgangers with a twist, malevolent doubles on a ghastly mission. And that’s where the family’s troubles truly begin. In Get Out, filmmaker Peele opened a disturbing yet necessary discussion about race, class, and power. Us passes that discussion through the eye of the needle and then expands it, with one of the most hair-raising horror scenarios in recent memory. The Wilsons aren’t the only people with doppelganger issues. The midnight movie fan in us immediately recognizes what Peete is on about – thematic riffs from Night of the Living Dead (and every zombie knockoff ever made), Stephen King, the cinema of Michael Haneke (both the Funny Games) and Kurosawa Kiyoshi (Doppelganger), last year’s Hereditary, all the various versions of Invasion of the Body Snatchers, etc. A reasonably familiar brand of fright. Or so it seems. After we finish mopping our brow in the wake of a marvelous panorama of grotesque mayhem, we realize we still have to deal with Peete’s allegorical puzzle. These are not mere capricious phantoms tormenting a middle-class African-American family for the idle sport of it. They are the “Tethered Ones,” restless spirits from down below (ghosts of slaves? Lynched souls condemned to wander? Victims of official brutality?) seeking retribution from their living mirror-image counterparts for sins of the past. “It’s our time now, our time and place,” moans Adelaide’s bug-eyed double, Red, who seems to have leapt out of a pre-Civil-War daguerreotype. The Wilsons are not the only ones with violent replicant twins. Their friends the white Tyler family, led by Kitty (Elisabeth), who live nearby, are also up to their eyeballs in undead invaders. And then, it occurs to us that the red-clad Tethered Ones might conceivably be stand-in Trumpistas, the deplorable MAGA flip side of well mannered, upscale folks who can afford to escape to cottages on the lake, far away from the hatred. The back story is open to a variety of interpretations. Peele, who already had a fine career as a screenwriter and actor of mostly less-than-challenging material, is cultivating an electrifying field of artistic commentary as a director of fictions, first with Get Out and now, masterfully, with this. The action scenes and their underlying motivations snap tightly together like clockwork, bolstered by superb performances from the entire cast. Nyong’o deserves the lion’s share of praise for her unnerving dual roles, but young actors Curry and Wright Joseph are also wondrous to behold. As are Michael Abels’ music score and the cinematography of Mike (It Follows) Gioulakis. Drop whatever you’re doing and run to see Us. You might recognize someone you already know.